The Herbarium does not yet have a complete electronic database of its collection. The following database includes a partial list of specimens collected in Louisiana, with at least one specimen from each parish where the species occurs. Some specimens are included from other Louisiana herbaria. Only about 10% of the entries include the details of the collection location -- most only include the parish where collected. 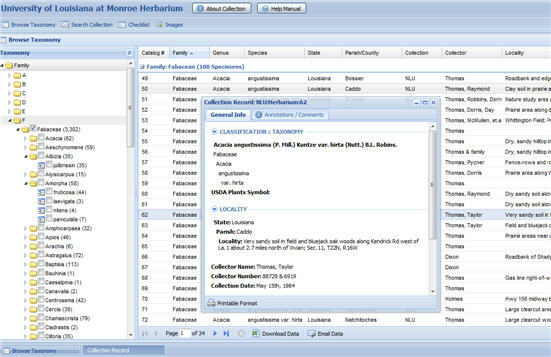 Search the ULM Herbarium database. ©2008 University of Louisiana at Monroe. All rights reserved. The official website of Herbarium NLU.